Powers of Mahakaal (messenger of Shiv) is famous by the name of Mahakali or Kali. The presence of Kali was far before the creation of world. Kali is the supreme according to primitive mythology. Ratri (night) is the image of Pralaya (end of the world) of which ardhratri (mid night) time is mahaghortam. This is the time of Mahakali the time from Ardhratri till the time before Surya Uday (sunrise) is the time of Kali. Mahakali is the creator of the powerful and time to its origin. That is why kali is the main element of the world. kali is present in many forms surprisingly the believes are unable to reach or find her. Mahakali sitting on dead bodies looking dangerous with sharp teeth and features and laughing (smiling) appears to be scary Kali has got 4 arms one with Khadag second with the Narmund (skull of a dead body and the third with abhayamudra and the fourth with a var. A necklace of skulls around the neck with tongue out almost naked, resides in Shamshaan (cremation ground). Markandeya Puran describes the goddess from the most powerful. 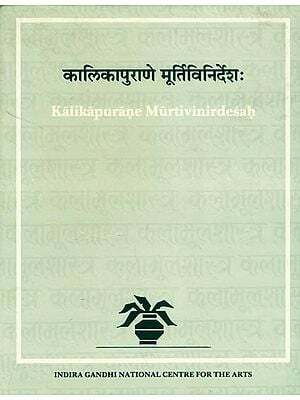 Chapter 8 Shri Durga Satashati states that goddess kali originated from the forehead of Goddess Ambika. Long time ago Shumbh and Nishumbh (2 devils) became so powerful and strong that they defeat Devraj Indira in a betel. They took all the rights from Indra and sat on the throne of heaven. After defeating the lords they threw them out of heaven. Devgan started searching for security. Before this a devil named Mahisashur along with his force took over indrapuri. All the lords prayed to Shir Durgaji. Durga along with force attacked Mahishasur and defeated and killed him and his men. All the lords came together and thanked Goddess Durga by praying and goddess Durga blessed them happily and assured then for further help. In response all the lords praised and started slowering flowers on goddess Durga. This time because of the fear of the devils Shumbh and Nishumbh the lords to recite pray for Goddess Durga. Suddenly she appeared and assured the lords for their safety and told them not to fear as she attacked on the devils with her force and weapons. During the war amongst both the forces devil chand and mund were killed. They were the most powerful amongst the forces of Shumbh and Nishumbh. The lions tear all forces and eat. 86 Udayudh Asur Senapati (Armymen) and 84 Kambu Asur Senapati along with their troops also joined the war. Koti Veerya 50 kul Dhurma Vanshi 100 kul, Kalak, yorhayad, Morya Vansh Dhurma and Kakeya Vanshi named devils also joined this horrible war. Angry Shumbh along with his warrior troops also plunged into the war field. That time when goddess Durga saw these powerful faces marching towards her she suddenly attacked themwith her Dhanush (weapon). The attack made a loud noise/sound. Goddess Chandika also followed and made a sound (with her weapon attack) which doubled the former sound. 1. Lord Brahma’s power resides in a Rudraksh Mala and he along with his Kamandal riding on a hans (duck like figure) came to the battlefield. That is why it is called Brahmani. 2. Lord Shiva’s power trishul (trident) in one hand wearing a kankan (mala) of Snake Mahanaag forehead bearing image of moon came riding on an ox. 3. Lord Vishnu’s power Shankh (shell) Chakra (wheel) Gada (a weapon) a khadak and a dhanush named sharing came on a Garuda (vulture). 4. Swami Kartikey came residing on a peacock. 5. Yagyavarathi’s power came in one of the Varahi Sadhu’s body form (decorated body) to fight against the devils. 6. Lord Narasingh also followed he was lion faced and the rest of the body was of a women who’s hair was so powerful. 7. Lord Indra’s powers brought Eendri Vajra (light) and riding on Aravat Gaj (Elephant) came to the war who had 1000 eyes. This war was organized by Lord Mahadev. Lord Shiva ordered all the goddess to come together and destroy these sinces. 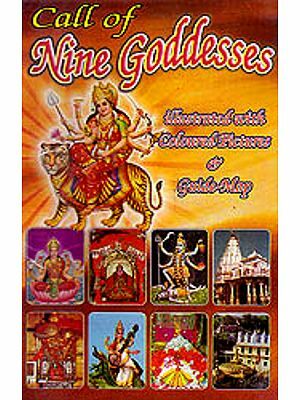 Goddess Chandika originated from the body of goddess Durga who played an important role and had powers as strong as about of several lions. Goddess Chandika ordered lord Shankar to go to Shumbh and Nishumbh as he representative and warn those evils for the safety of their lives and order them to go back to patall lok. Triloki is governed by Indra. 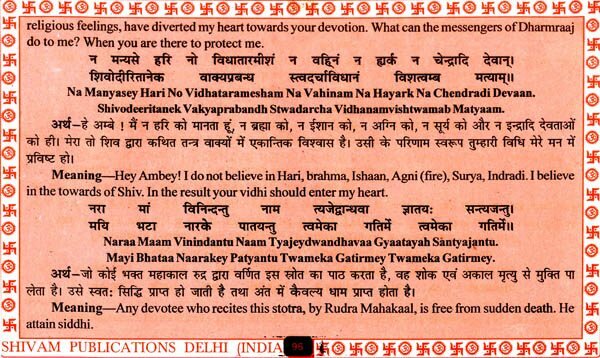 Devatas will not give up share of Yagya he said if you are so confident of your energy then fight with me. My powerful yoginia and tigers are ready to tear you part and drink your blood. On hearing the message of goddess Chandika by Lord Shankar the devils got energy and attacked Goddess Katyayini. The goddess also attacked back on them with Trishul (trident) and destroyed them. chandika also followed. Khatvanga (a sword in hindu mythology) and Trishul (trident) were given to the troops. 3. Kumari Devi also destroyed the enemies by the powers. 4. Endri Devi is so powerful that by the reflection ray of her light the every is destroyed. 5. Goddess Varahi chewed the enemies by the help of her powerful jaws. 6. Nirsinghni with her tiger like nails killed the devils. 7. Many of the Devils were scared to death by Shivdouti. 8. Then the troops of tigers attacked the enemies and the rest of the devils ran away. Seeing all this a devil named Raktbeej appeared with a loud noise a sound. He was granted with the a power that even if a drop of his blood feel on the ground a new devil (Raktbeej) would arise from that place start fighting. Raktbeej marched towards Endri Devi with a Gada. In return the devi threw a powerful ray of light on him. As soon as he got hurt he started bleeding. The amount of blood drops that fell arouse more Raktbeej’s and they also started fighting. The goddess was surrounded by so many Raktbeej’s. 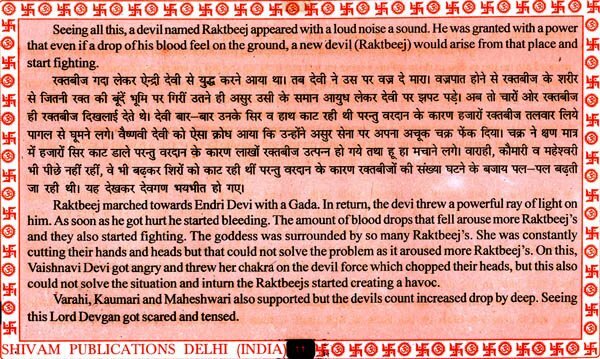 she was constantly cutting their hands and heads but that could not solve the problem as it aroused more Raktbeej’s on this Vaishnavi Devi got angry and threw her chakra on the devil force which chopped their heads but this also could not solve the situation and in turn the Raktbeej’s started creating a havoc. Varahi Kaumari and Maheshwari also supported but the devils count increased drop by deep. Seeing this lord Devgan got scared and tensed. Goddess Chandika got angry on seeing all the lords helpless. Due to anger her face got red and because of more anger it turned black. Her eyebrows got turned and Kali Devi emerged from her forehead. Then goddess Chandika explained to Goddess Kali that now she will attack on this powerful creative and warned her to insure that his blood does not drop on the ground. They were told to collect the blood in a Khapper (utensil) and when it fills then drink it but do not let it drop. She was happy to drink it and the transformed into a Rodra and roamed around with a Khappar in her hands. On the other hand goddess Chandika was cutting the heads of the devils. Kali did not let even a single drop of blood fall in the ground. She licked the blood by lengthening and broading her tongue once the pitcher got full. This way the power of Raktbeej got defused. He lay on the ground in pieces like a chapped tree. Yoginiya started dancing on those laid pieces. The lord felt happy and showered fragranced flowers on Devi.